When inspiration strikes, it gives us a wonderful flow of power and motivation, and enables us to produce high quality work at a fast pace. But who has the time to sit around and wait for inspiration to spontaneously occur when we all have pressing matters and deadlines to meet? This is exactly why I’ve compiled a list of the top 10 most effective things that inspire me to write instantly! No one knows how to say anything better than Writers. Luckily, there are countless websites out there devoted to quoting authors and their knowledge. Authors offer many words of wisdom, comfort and humor, but their most valuable quotes by far are the advice they give to other writers. Whenever I read a quote, I find that my determination and enthusiasm are completely revitalized. So many quotes from famous authors have inspired me that I decided to tweet one a day on my twitter account. That way I can feel inspired to write every single day, and hopefully help inspire someone else in the process. Like most writers, I’m a regular at every minor and major book store around. If I’m out running errands and a book store happens to be nearby, I can’t help myself from stopping in to browse the ‘New Arrivals’ section. Being surrounded by books is a wonderful feeling, and it always gives me encouragement that my very own book will someday be among them! Not to mention, that magical smell of new books is an instant anti-depressant. So stop by your closest book store (or Library- after all, it’s free!) and pick up some new books to read. Thanks to the internet, sharing images is easier than ever. Just through one Google search alone, I can see into any number of people’s homes, cars, bed rooms and offices. People are posting pictures of themselves and their lives in abundance, and some of them really know how to make things look good. Seeing other author’s picturesque workspaces never fails to inspire me to clean off and organize my desk. Especially since working at a crowded desk makes my thoughts muddled. Once I clear everything off and put it back in order, it’s like whipping a dirty windshield clean. Give it a try for yourself, and who knows? Maybe all of the clutter you’ve gotten used to might actually be sabotaging your creative process. I chose this image because I’m primarily a fantasy writer, and luckily for me, there are ENDLESS amounts of beautiful fantasy art for me to gaze upon. One of my very favorite websites for finding inspiring fantasy images is Pinterest. There are so many talented artists out there, and they make me feel like I’m looking right into the world I’m writing about. Then while I’m browsing, I often discover something new to put in my story. If you use the right key words, regardless of the genre you write- you can always find some inspiring images that relate to your story. Of course it’s necessary to understand something well before writing about it, but I often find that research on its own is more than enough to inspire me to write a few pages. Once I have a complete understanding of the way something in my story works, like alien technology or landscape, I feel unstoppable. This is especially true if something in my story is based on a real concept or item, then I can learn as much as I can about it and have lots of reference material to fall back on. So take some good notes and make sure you really do understand a concept by explaining it to someone else. For me, listening to the right kind of music is key for my writing process. If I really need to concentrate, I listen to music without lyrics, such as classical music or alternative lyric-less audio. If I’m writing a sad, dramatic, angry or exciting scene, often movie sound tracks provide excellent mood music, and Pandora has endless stations to choose from. Music doesn’t even have to relate to your story, you can just put on your favorite song or any classic inspirational track like “Eye of the Tiger” or “Don’t Stop Believing” and dance around your house until you feel inspired enough to write! Odds are that you already know what type of music you like and works best for you, so just think about how you can apply it better to your work. Maybe your favorite genre of music can be doing more for you than you realize! When I’m really stuck, I always have this trick to fall back on. Pick up your laptop and writing supplies and get out of the house! Whether it’s just sitting to the neighborhood park for 5 minutes, or spending the afternoon in a warm coffee shop, getting up and moving around always gets my thoughts flowing. When I go somewhere else to write, like a café or library, then I have nothing to do but write. In this a way, I give myself no choice but to get things done. The same thing can’t be said when I’m writing at home, surrounded by distractions. Another great plus to being out in public is people watching. My stories always contain people, so observing real live humans is a great benefit for my writing. While I was already on Pinterest looking at inspiring fantasy images, I also found a number of intriguing writing prompts, (as well as genius writing tips & tricks). So while you’re already on the internet from my last tip, open up a new tab to search for some Writing Prompts. It might seem strange to think that not writing at all will help inspire you, but putting too much pressure on yourself and forcing yourself to write is a no-go. If I concentrate too much on trying to write well and quickly, I often get less done and the quality of my writing suffers. Sometimes the best thing you can do for yourself and your writing is to just back off and take a break. Go relax and have some fun. Watch a movie with friends or go on an outing, and do your best not to think about writing. You’ll find that as soon as you stop stressing over what to write, the answer becomes clear and comes to you naturally. Well, that's my list! I hope it can be of service to you! What are some things that inspire you that I didn't mention? If you read my last post, you can tell this has been on my mind. Social media is a great way to build community, but it can be infuriatingly difficult at times. 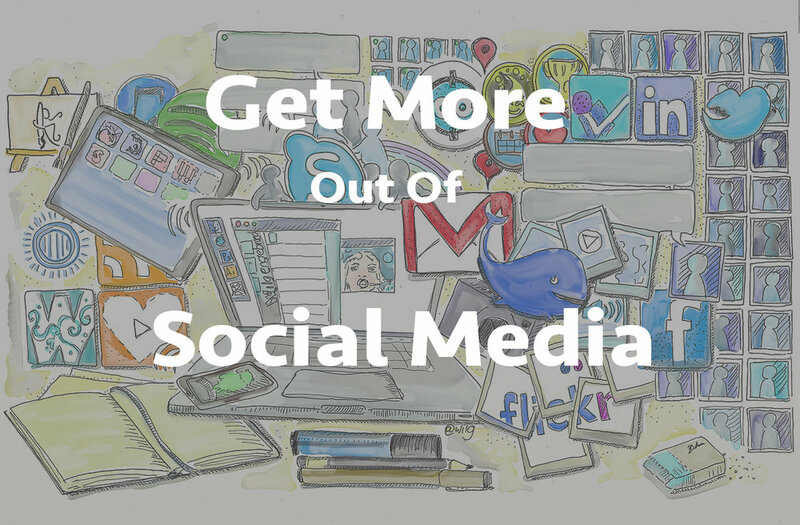 This article from StandoutBooks (LOVE their helpful posts) tells you more about how to use social media for maximum effect. It's clearly written and gives thoughtful, practical advice. Let me know if you have any other methods for negotiating the online social territory! Whether you’re a newly self-published author or someone who’s been around the block a few times, chances are you’ll wish that your social media following was a little more engaged. Some writers struggle to gain a single ‘like’ online, while others who’ve patiently cultivated their following can become frustrated when even after months of building hype, many of their followers fail to buy their latest novel. I find that there are four levels to any author’s fan community. I like to call them the Disinterested, the Interested But Lazy, the Engaged Who Don’t Follow Through, and finally, the Die Hards. The trick, as far as I’m concerned, to an effective social media campaign is to encourage followers to climb the ranks, slowly rising through the levels to become Die Hard fans. Influencing fans isn’t always easy though, and as such, in this article I’ll talk a little about each of the three lower levels, and how you can encourage your fans to level up. Hello all! I've got some exciting news. I've just launched a twitter campaign to help promote self published authors. I'm so glad to give to the indie community and offer a little bit of exposure to my fellow writers who are working to promote their own work (and find time to write the next novel!) Twitter has been a tough social media format for me. It's so loaded with garbage it's hard to sift through to find the gems. Instead of scrolling feeds, I decided to find a way to check out new authors as well as use twitter to promote them. With an open-invitation system (just email info@freeflyingpress) and author-designed tweets (send me 140 characters and an image of your book) I can quickly schedule in 4 tweets to help spread the word about new books. I hope this model will connect me with other authors & help strengthen the indie community while sharing news about hot new titles. I'd love to hear your comments and thoughts about how to use twitter to build community and help each other grow our author online presences! & in the meantime, check out a preview my latest ebook release The Heart of the Lone Wolf coming in September. For only .99 you can get your preorder copy today!